Between Isaac’s love of herbs and Josh’s love of stones, it soon became clear that the studio needed a shop. The perfect little shop for herbalists, stone collectors, mages, or the curious tourist, we carry items for health, magic, and beauty. Our apothecary is stocked with a varied selection of bulk herbs and resins, most organic or wildcrafted. Our stone collection runs from small tumbled crystals to larger mineral specimens for the rock enthusiast. We have salves, oils, and teas made by Isaac, as well as herbal products made by local companies like Wildcrafting Wisdom. For the budding magical herbalist, we offer mortar and pestles, incense burners, strainers, and more. For those with a more metaphysical inclination, we offer tools of ceremony, magic, divination, and healing. We also offer an array of Josh’s concrete art, his “Concreations.” Josh has a knack with concrete. The son of a mason, he's been working with rocks and concrete since he was a kid. 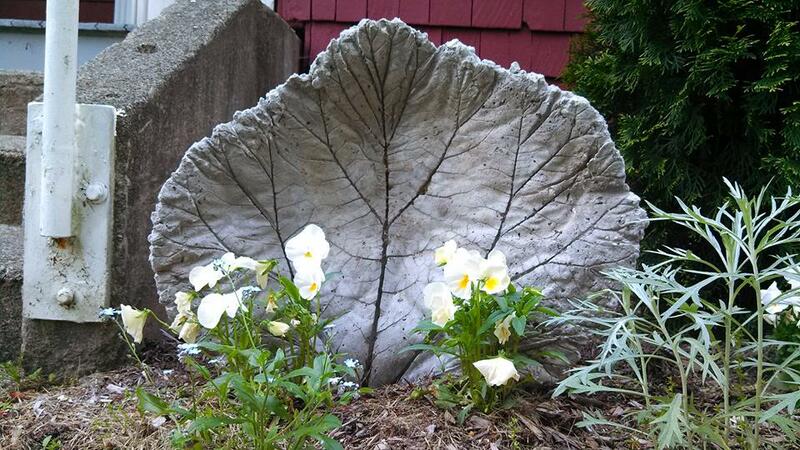 He began to make concrete leaves years back, and his creativity blossomed. Memorial leaves, interesting sculpture, and options in concrete dye are only part of his growing repetoire. Stop in at the studio to see what we have, or message Josh via our Contact page with the subject "concreation" to learn more. So, stop by and explore our little store. Who knows what magic you may find.